Every manufacturer has a few oddball motorcycles in its back catalog. Bikes that sounded like a great idea on paper, but never really caught the imagination of the public. 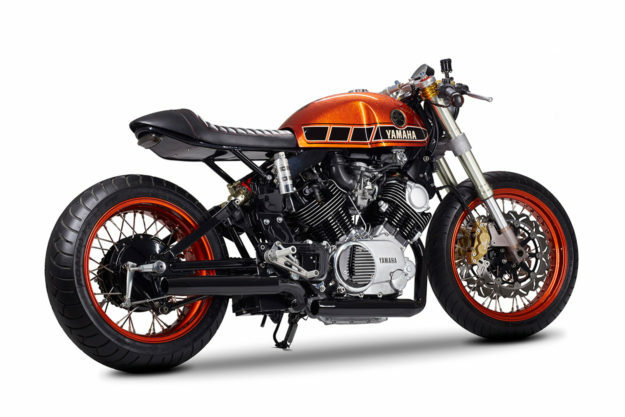 In Yamaha’s case, one of those bikes is the TR1—a V-twin tourer from the 1980s, closely related to the more successful XV750. 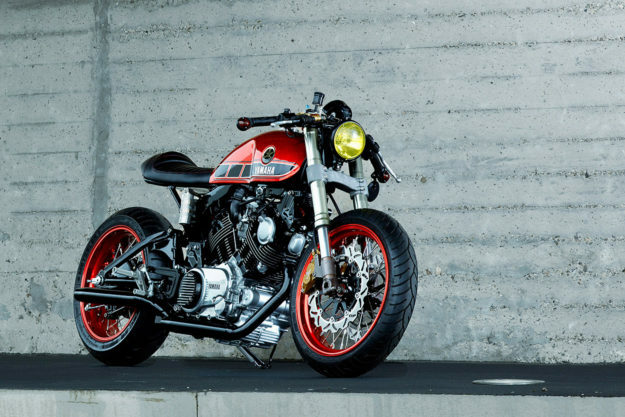 Fast forward thirty years, and an ungainly TR1 has become one of the best customs we’ve ever seen. 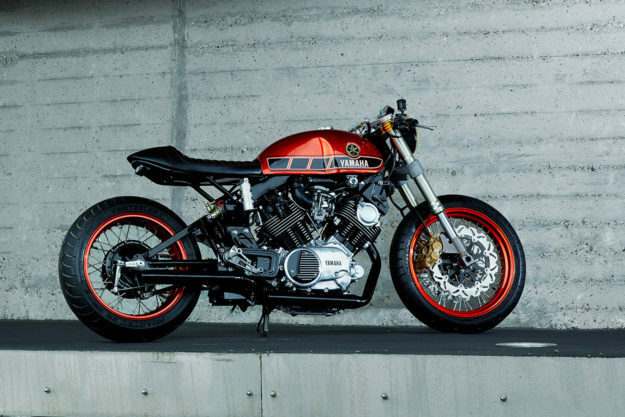 It’s been given the cafe racer treatment by amateur builder Roland Snel, who’s taken inspiration from trailblazing Virago specialist Greg Hageman. Miyazawa is the father of Yamaha’s Yard Built project, so it must have been heartening for Roland to get that seal of approval. So Roland chose a 1984-spec TR1—mostly because it has chain drive, making it easy to fit a wider rear tire by offsetting the chain. Although he was aiming for a vintage look, Roland was not prepared to sacrifice handling dynamics. 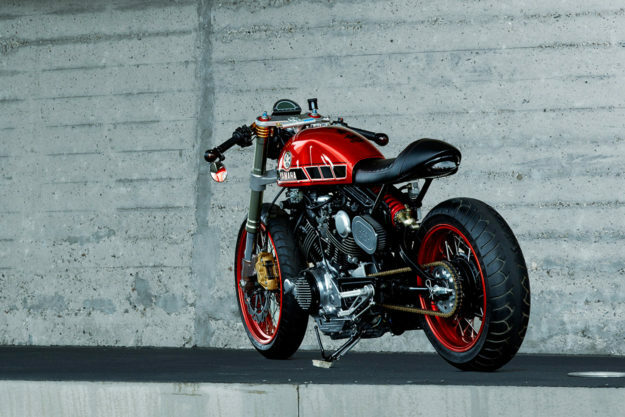 So he’s replaced the 30-year-old Showa forks with more modern USD forks from the same company—lifted from a Ducati 916. 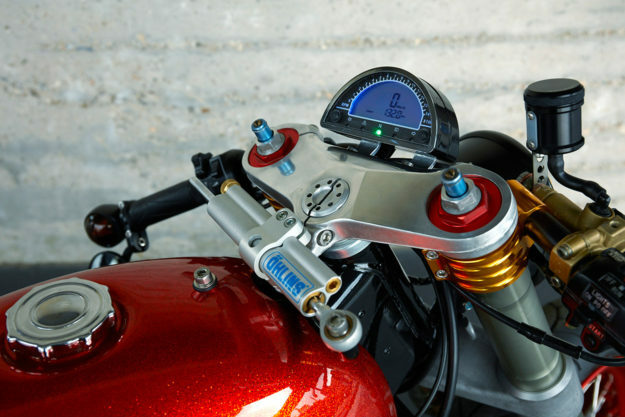 At the back is a Showa shock, taken from a Triumph Speed Triple. To complete the front end, Roland has added an Öhlins steering damper, a combined digital speedo/tacho, and a frame-mounted Bates-style headlight—to keep the big fork legs free. The wheels have been upgraded too, using aluminum Akront rims. There’s an 18-incher up front, laced to a Honda GL1000 hub with stainless spokes. Behind is a beefier 5.5/17-inch rim. 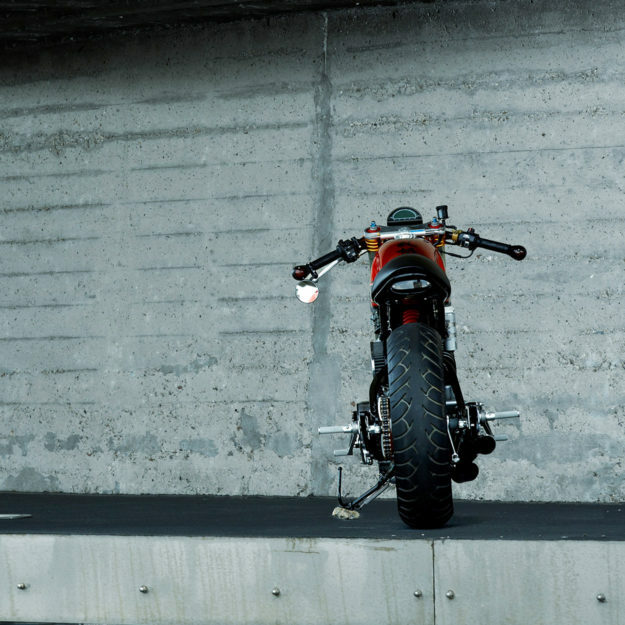 The tires are grippy Metzeler Roadtec Z8s, a modern sport-touring compound. 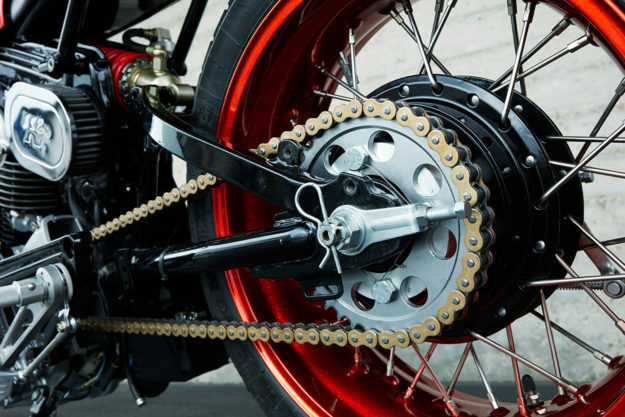 Anything less would probably lock up at the front: Roland has installed Brembo 4-pot brakes and wave rotors. A more sedate Honda CB750 drum works on the back wheel. Fortunately, the engine didn’t need any work: The air-cooled 75-degree V-twin had done only 29,000 kilometers. 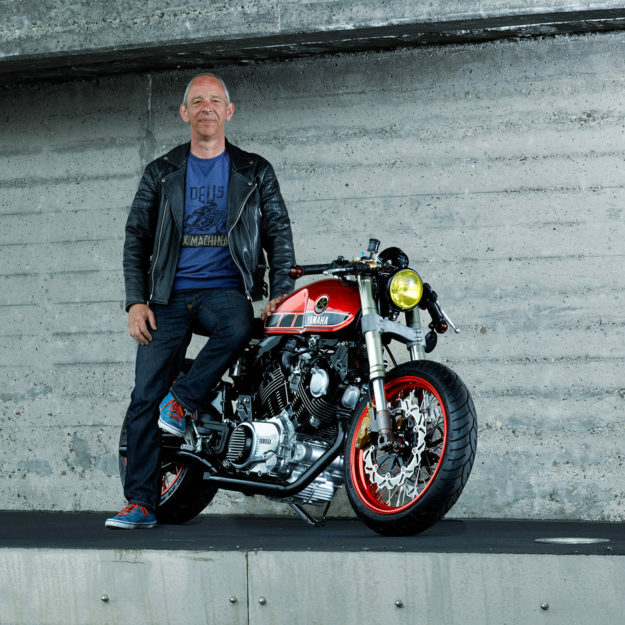 “I took off the cylinders for painting and checked the engine internals, but it looked perfect inside,” says Roland. He’s upgraded the carbs though: There’s a Dynojet stage 1 jet kit, to take advantage of the more open exhaust. 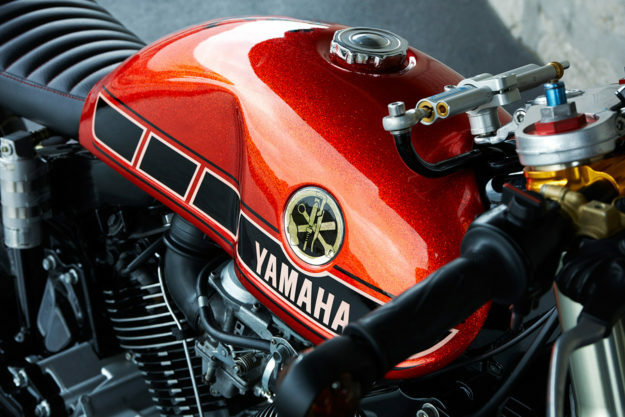 The modified headers hook up to ceramic-coated MAC mufflers, and the different routing has given Roland room to mount a lithium-ion battery under the swingarm. To emphasize the engine, he’s machined the cooling fins and added matching fins to both crank covers. The extra horizontal lines give the TR1 more of a custom vibe and Seventies look. Sometimes it’s better to stick with known quantities, and in this case, that means a Motolanna seat and a Benelli tank. “I could not resist the combination,” Roland says. And why not? 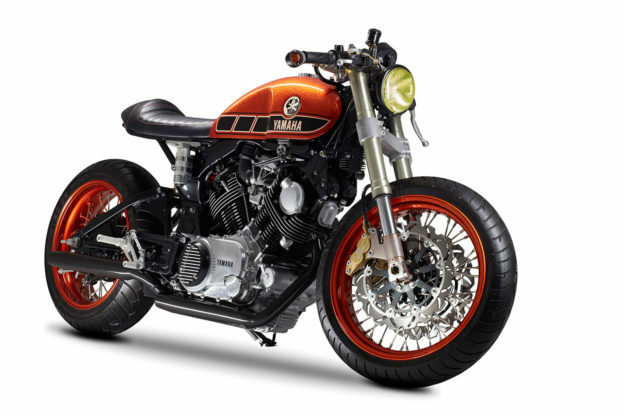 They’re a perfect match for the lines of a big Yamaha V-twin, and Roland has installed a flatter rear frame to keep those lines nice and straight. The level of detailing is amazing. Roland has replaced all the nuts, bolts, brackets and clamps with new stainless steel fittings—or had them re-plated with zinc alloy. The frame is powder coated in glossy black, and the wheels and tank are finished in tangerine candy metalflake. 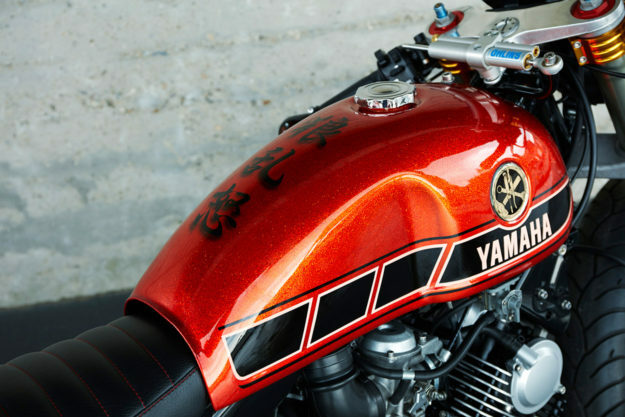 The black Yamaha speed blocks and Japanese Kanji characters on the tank were hand-brushed on. 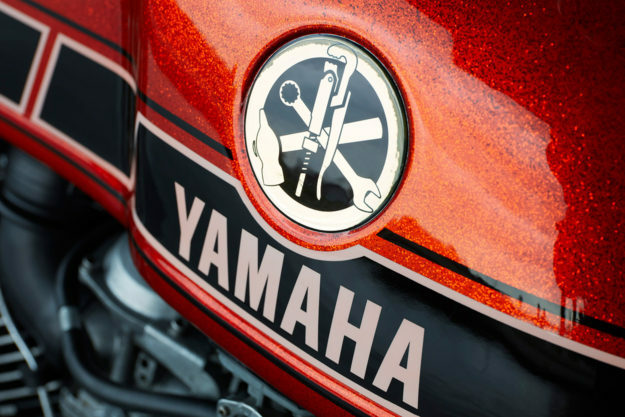 Look closer, and you’ll spot a cleverly modified Yamaha logo: a monkey wrench, a hammer and a spanner have replaced the traditional tuning fork. This TR1 is an exercise in taste, craftsmanship and judgment, and we love it for that. 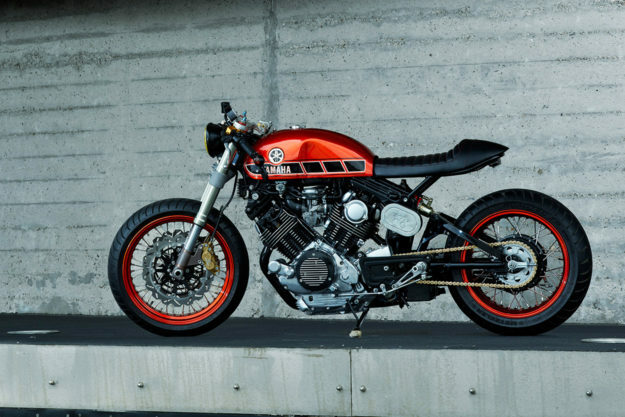 But what we love even more is the idea of Shun Miyazawa co-ordinating Yard Built projects from all over Europe, while this beautiful cafe racer was being pieced together just a few kilometers away. Images by John de Koning.